First of all you must understand that dermopathy is a term which involves all skin problems and complications during diabetes. It is characterized of small spots or pigmented (red, light brown in round or oval shape) patches usually located in your lower limbs (usually on your shins). Actually, these lesions appear more often after an injury or trauma in this area and remains in this condition usually quiet long time till they disappear. If you want to know the reason why it happens, you’ll never find a specific one. It’s all related to nerve and blood vessels damages that occur during diabetes. If you are diabetic and have had it for about 10 to 20 years and are older than 60s, then most probably you’ll face this complication. -	Location: commonly – both shins; less frequently– on the front of the thighs, side of the foot, scalp, trunk or forearm. You cannot do anything to treat a diabetes dermopathy, because it’s something that your body and skin tend to clear themselves. What you can do is to prevent its onset. If you’re a diabetic, you should get better control of your diabetes. You should keep your blood glucose levels at a steady range, near your optimal ones, such as acceptable glucose levels. You may help yourself by inserting natural herbs in your daily diet plan menu. Click here to get to know about a natural formula that helps controlling your blood sugar levels and prevent future diabetes complications such as diabetic dermopathy. 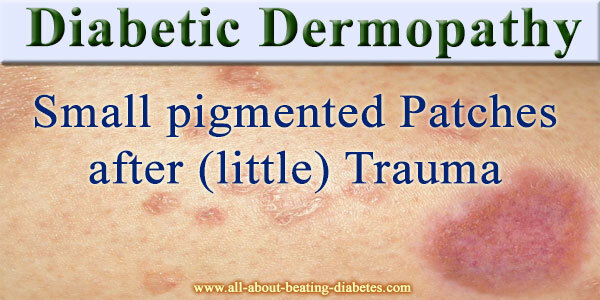 If you don’t know yet that you’re a diabetic, but you’ve noticed these lesions recently, contact your physician. He/she will direct you what steps and lab screenings you need to undergo to have your diagnose.